Ten Speed Press, 9781607748892, 288pp. Following on the heels of Lisa Cron's breakout first book, Wired for Story, this writing guide reveals how to use cognitive storytelling strategies to build a scene-by-scene blueprint for a riveting story. LISA CRON has worked as a literary agent, a TV producer, and a story consultant for Warner Brothers, the William Morris Agency, and many others. She is a frequent speaker at writers’ conferences, and a story coach for writers, educators, and journalists. She teaches in the UCLA Extension Writers’ Program, is on the faculty of the School of Visual Arts MFA in Visual Narrative Program, and is the author of Wired for Story. She splits her time between Santa Monica, California, and New York, New York. "Using brain science, Cron busts the myths of good writing to help you find the real story behind all that plot and metaphor." "In [Cron's] new book, Story Genius, she picks up the. . . theme. . . that a protagonist’s internal struggle makes the story work, and offers step-by-step advice on how to exploit this truth about neuroscience for richer, deeper, better first drafts. . . .Cron provides exercises and examples to keep writers on track, always highlighting the fact that emotions engage the brain faster than anything else. . . .The concepts are easy to understand and they are certainly important. Even if you can’t go on a retreat, you should try to find time to do the exercises for your own blueprint." "It’s a simple question: 'How do you write an effective, engaging story?' Ask Lisa Cron. An accomplished author and story coach, she has just published her second book, Story Genius. A manual of sorts, it teaches cognitive storytelling strategies and uses actual brain science to help make its readers into better writers." "Cron, author of Wired for Story, proposes this new book as the answer to the question, What’s the biggest mistake writers make? 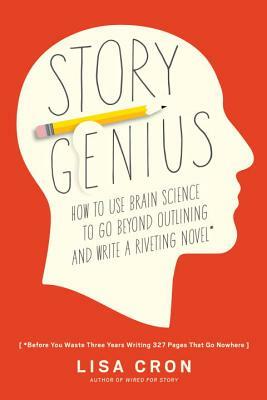 She uses psychology and other sciences to explain what makes an utterly compelling story and how to write one. . . .Novice writers looking for a step-by-step guide to how to build—or fix—their novel might find a lot of useful information in here. . ."
"Lost in the quagmire of trying to write a novel? Well, forget everything you've ever been told about story, because chances are, it's totally wrong. So where to turn? Story guru Cron not only gives you the skinny on why and how stories work (and why and how we respond to them), she also shows you how to craft a novel step by step, working with author Jenny Nash from the germ of an idea to a living, breathing story. I'd never consider writing a novel without Lisa's input, and neither should you."